Ragupathi s/0 Gajapathi s/o Valayapathi, spake Rajnikant in Velaikaran movie. Rajni hitting the villains black and blue in the garb of hitting a big fly was a big comedy those days. In a late film, Vadivelu’s Hitler mush would be mistaken for a bee and would hit with a stone, making him bleed !! The final test is ending for a finish at Johannesburg, the largest city in South Africa. Johannesburg is not one of South Africa's three capital cities, it is the seat of the Constitutional Court. The city is located in the mineral-rich Witwatersrand range of hills and is known for stinging bees !! ~ remember all the players falling flat on the ground including the big burly Swaroop Kishen, when bees swarmed the ground in Bangalore ! ~ we have seen stray dogs, sea gulls and the like on a Cricket ground – then bees too !! It is stated that swarming bees are generally not a threat, they are intent on locating a new nesting place. The will behave aggressively if they are disturbed or threatened. But when people panic on seeing large swarm of bees and make an attempt to disperse the bees, they sting and it would be painful and venomous too. When a bee stings it secretes a compound called isopentyl acetate. This is a hormone which in sufficient quantities smells like banana oil. It triggers the 'attack/defend' part of the bees brain. The bee leaves a tiny amount of this hormone at the sting site. Humane and ethical are the “buzz words” when it comes to the business of bee removal. Bees play an integral part in the planets food production and also in ecological stability. Removal of bees is what is aimed at, safe removal and relocation. But often men kill them with fire or with insecticides, when schools of them would die instantaneously. At Johannesburg, the score card reads : Australia 221 and 88 for 3 (Handscomb 23*, Shaun Marsh 7*) need 524 more runs to beat South Africa 488 and 344 for 6 (du Plessis 120, Elgar 81) ~ that could have been even worser, if not Quinton de Kock missing out a stumping late on the second day. Now in a Test where South Africa, had been amassing runs and more runs against attack crippled by injury and controversy. It was a day on which South Africa started with an advantage of 401 and batted on, and on, and on, past a lead of 450, and 500, and 550, and 600. The accepted explanation was that Faf du Plessis would have a limited attack at his disposal: Morne Morkel had a side strain, Kagiso Rabada was suffering from a stiff back, and Vernon Philander had strapping on his leg. By stumps, Morkel had 2 for 18, Rabada had caused new-ball jitters, and a catch had been dropped off Philander's bowling. Du Plessis had finally declared at tea, setting Australia an ostensible target of 612 for victory. For context, only once in Test history has a team scored more than 500 in the fourth innings: in the famous timeless Durban Test of 1939, England made 654 for 5, a draw declared on day 10 only because England, who were just 42 runs from victory, had to board a train to catch up with their ship home, which had already left Durban without them and was now in Cape Town. Muhammad Ali, the famed boxer was cited as floating like a bee and stinging like a bee. A similar floating delivery by off-spinner Keshav Maharaj stung wicketkeeper Quinton de Kock, courtesy a real bee which appeared out of nowhere at the New Wanderers on Saturday. Shaun Marsh attempted to dance down the track and loft Maharaj over his head but missed it completely. However, de Kock grassed the stumping opporutnity after he was stung by a bee on his upper left-arm. He immediately pulled away, clutching his arm and let the ball roll by as the batsman survived a close shave. Commentators on air thought it was a missed stumping chance by the keeper but replays showed that de Kock had moved away after he was stung. Footage showed the southpaw flicking away the bee. However, the miss did not prove too costly as Maharaj picked up Marsh’s wicket a few overs later. Jo’burg is infamous for its notorious bees. 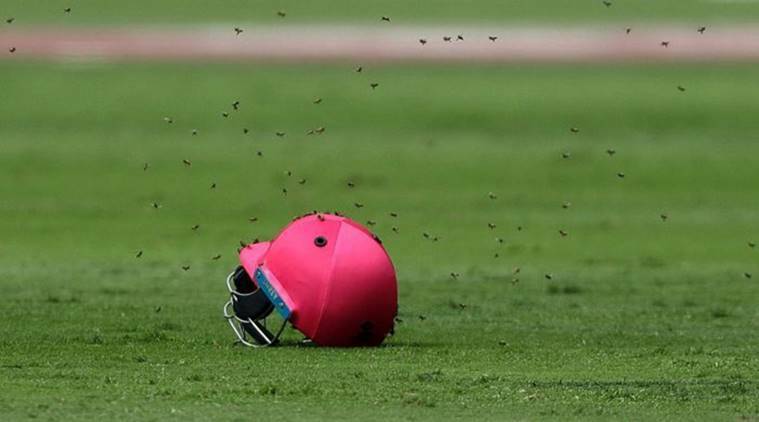 In February last year, a Test match between Sri Lanka and South Africa had to be stopped for nearly an hour as bees swarmed the entire field. Commentators Shane Warne and Mark Nicholas originally thought Marsh may have got an edge, leaving de Kock unable to react in time. But the gloveman was clutching his upper arm. 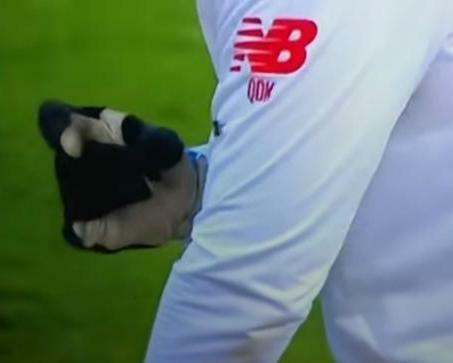 The same eagle-eyed South African television camera operators who caught Cameron Bancroft ball-tampering during the third Test, showed it was in fact a bee which had stung de Kock on his left arm at the exact moment as the stumping opportunity. The footage shows de Kock flicking away the bee through his gloves and trying to remove the sting ! ~ but no amount of help from insects is going to help Australia save the Test !! !